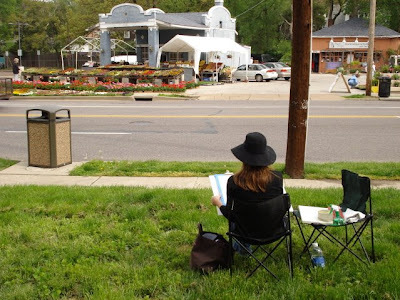 So... All day Saturday was the Paint Webster plein aire competition sponsored by 63119 Art!. 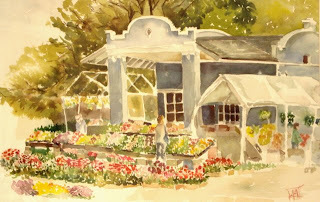 I chose one of my favorite places to paint - Roger's produce, as it has tons of beautiful geraniums out front and I always hurt my neck trying to look at it while I drive by. Besides, I knew I would be outside painting for at least 5 hours, so it had to be something I enjoyed looking at. My sis-in-law and brother popped by and took this picture of me painting. Well, I have mixed emotions about this. First I really enjoyed the opportunity to paint under the gun. It really leaves you no time to over analyze and judge your work too harshly. You just have to get it done. Once again, I learned a great deal from this experience. As usual, I try to paint too much. You just can't paint the world - or an entire road side market for that matter. I really should have kept it simple. Ultimately, I really didn't like the finished project. I'm only posting it as a lesson. I think I was just trying too hard and not trusting myself. 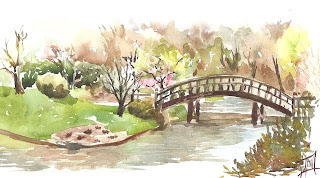 I find when I paint for myself in plein aire it's much freer and spontaneous like the picture I did below at the great botanical gardens here in Saint Louis. I certainly need more practice in plein aire. Winslow Homer was the master! There was some very beautiful work on display at the end of the day. It was wonderful, inspiring and intimidating at the same time. I have so far to go!!! There were less than five paintings in watercolor???? "I don't want to freak you out or anything, but I stopped my car and parked it because I thought you were the most beautiful woman I had ever seen." Any my response was to laugh and tell him he needed to get out of the house more. Then I said thank you and told him that was quite a compliment. Later, after the day was over, the painting finished, framed, judged and deemed "not a winner", I had dinner with my brother and his wife and told them about my day. Becca was quick to point out that even though I didn't win the prize money I was called "the most beautiful woman ever" by a complete stranger so the day wasn't a complete bust. Yeah, maybe. But I would rather have painted the most beautiful picture "ever".